Celebrate your engagement with one of the most respected names in bridal design with this ring from the Vera Wang LOVE collection. This piece features an expertly cut heart diamond centre stone, given more prominence with a double halo of precious 18ct White Gold that surrounds the centre. The twisted shoulders are also diamond set for a glamorous engagement that will be remembered for the years to come. As with all of Vera Wang's designs, the signature sapphire is hidden underneath the centre as an authentic Vera Wang piece. The total weight of all diamonds combined is 0.70ct. 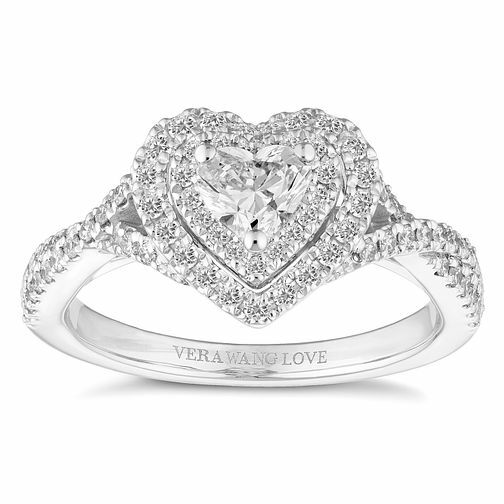 Vera Wang 18ct White Gold 0.70ct Heart Double Halo Ring is rated 5.0 out of 5 by 2. Rated 5 out of 5 by Anonymous from Unique and Perfect ring The ring itself is just perfect and it has a Unique style. I really love this ring. Its so beautiful. Just one thing before you buy it make sure its the right size as they don't re-size it otherwise it will damage the ring. Rated 5 out of 5 by Anonymous from Beautiful ring I have had many compliments on my ring and rightly so, it is a beautiful substantial size ring.